Polygonum convolvulus (Fallopia c.).commons.wikimedia.org (Accessed 7/2014). Fallopia convolvulus is a weedy annual vine to 2 m long from a taproot, stems slender, freely branched from base; stems somewhat rough (scabrous); leaf-sheaths membranous, entire, smooth. Leaves alternate, stalk rough, elongate, blade to 6 cm long, arrow-shaped to triangular, tip pointed, base lobed, sinus deep, wide, new leaves bluish. Flowers 0.2 cm wide, green outside, white inside; self pollinating, no insect visitors observed (Hume et al. 1983); inflorescence of short, interrupted racemes, to 6 cm long. Fruit dry, 1-seeded, achenes dull black, to 0.4 x 0.2 cm, tightly enclosed in enlarged calyx to 0.5 cm, sharply 3-angled, but not winged. Seeds viable in soil for up to 5 years. Emerging in late spring. Habitat: Open disturbed areas, flood plains. Notes: An agricultural weed since the 6th century, seeds apparently used by Neolithic Europeans for food or feed. 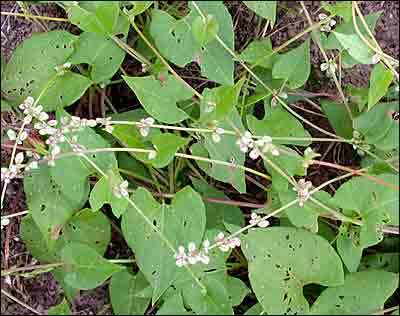 Black bindweed is attacked by a number of insects including: Gastrophysa polygoni a beetles that eats the leaves, and Pegomyia setaria a leaf mining fly. It is also host to a number of nematodes, fungi and viruses (Hume et al. 1983).